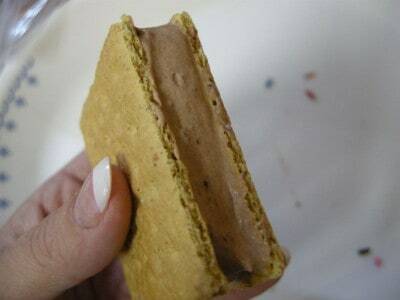 In this post, I’m going to show you how to make these delicious Grahamwiches with the only sugar being the scant amount present in the graham crackers. They are not only delicious but another great treat ready from your freezer anytime! They are also great to make with your kids! Before I do that though, I want to take a few moments to tell you why today is so special. Ten years ago today, I became a mother. July 6, 1999, my little Bradybug came into this world and it will truly never be the same. I had wanted to be a mother all of my life, for as long as I could remember. I had dreamed of it, having visions of being every ounce the kind of mother that mine was. Motherhood had always seemed to come naturally to her. She knew just how to nurture us, talk to us, care for us, and make every single day special. I just knew that, having always been the spitting image of her in everything else, motherhood would be no different. I took parenting classes, childbirth classes, infant cpr, and several early childhood education classes in college. I had taught preschool and babysat more hours than I could count. I felt certain that I was ready. One of the funny things about parenthood is how it seems to take delight in knocking us flat on our rears when we think we’re at the top of our game. If nothing else, Parenthood requires a sense of humor. Around day two in the hospital, I realized that I had no idea what I was doing. Not just minor insecurities, mind you, but full blown out “If the hospital finds out how unqualified I am for this, they’ll never let me take him home!”. I remember that day so vividly. Brady needed changing and my first thought was “Well, I’ll wait til Mama gets back from the gift shop so she can help me”. Then I became indignant with myself. “Hmph, I’m his mother, I can do this.” Ten minutes later I had a pile of wipes a mile high. Brady was crying, I was crying, and we had our first ever conversation. “Brady baby, I’m sorry, but I’m the only mother you’ve got so you’ll just have to make do with me”. His response was to scream louder. Can’t say I blamed the little fella. I watched the door nervously during my entire stay, just waiting on a nurse to come into the room and cluck her tongue before whisking my baby away to someone infinitely more qualified to raise him – one of those mothers who instinctively knew how to care for him, who could change a diaper in two wipes while humming and mentally constructing the perfect college fund. The next year was a blur of colic, milestones, scrapbook pages, stage three lasagna splattered on the walls, and this incredibly amazing bundle of cuteness and energy who charmed and won everyone over in a single glance. There was a bit of a learning curve but Brady was patient with me and I had lots of help learning the ropes. By the time he is twenty, I feel confident I’ll know what I’m doing. Has it really been ten years? Am I even old enough to have a ten year old child? (Y’all feel free to say “no” to that last question). Matchbox cars and dinosaurs have been replaced with the weather channel and science experiments. This kid is the only one in the house who knows how to set up a wi-fi connection and operate all DVD players, video game systems, and VCRs. He is brilliant, articulate, and an incredibly personable boy but the thing I am proudest of is his heart. My Brady is a very kindhearted person who, despite all of the material things he is blessed with, still places the highest value on people and small moments, sentiment and friends. Maybe I got lucky or maybe I’m not so bad at this motherhood thing after all. My money is on luck. Years ago, Brady and I were talking right before he fell asleep. We talked about taking a trip one day when he grew up and where we’d go. Even then, I knew time was slipping away fast and I found myself longing for a little more time just between the two of us. We went over possibilities of things we could do together, what we’d like to see and where we’d like to go. Somewhere amidst all of that we came up with going somewhere in the desert and riding camels along with seeing pyramids (do they even have camels near pyramids? I suppose so.). We made our plans to go and mentally sent Katy on a two week cruise with her Daddy during our time away. Now as I sit here, my little boy (who eats everything in the house and still manages to have ribs poking out through his skin) is standing in his rapidly growing body that is struggling to keep up with his overly large feet and playing Guitar Hero. I can steal a hug or kiss from time to time and even coax him into my lap if no one is looking but the moments are fleeting. He’s too busy growing and learning and experiencing every moment of his fast forward life. But when things settle down in the evenings, sometimes he’ll curl up next to me and we’ll both whisper about our dreams of riding camels together in the desert and I know it means as much to him as it does to me, even if we never make it there. Even if we only go there in our minds during these stolen moments on quiet evenings – me and the ever growing spirit whose magical presence in this world turned me into a mother. Thank you so much, Brady. I sure do love you. Today’s recipe has nothing to do with Birthdays but my tangents seldom do have anything to do with the dish. Y’all are so lenient with me! 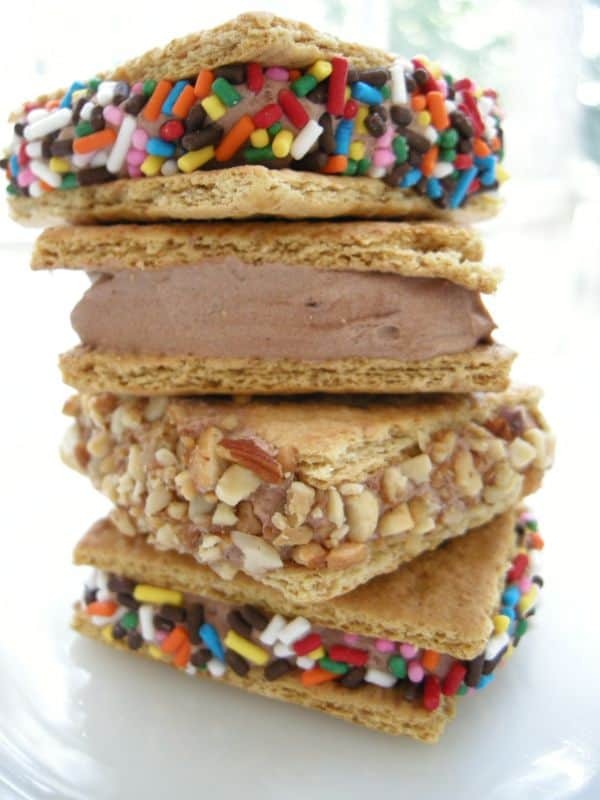 They taste just like ice cream sandwiches, but with a bit more flavor to them and a lot less guilt. I don’t split hairs when it comes to calling a recipe low sugar or sugar free. 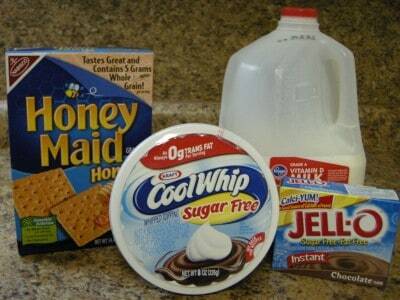 In this recipe, I am using sugar free pudding mix and sugar free whipped topping, the only sugar I count is the small amount added to the graham crackers. I realize there is some natural sugar in the milk but I count sugar in my recipes as sugar added in so milk in its natural form is alright in my book as is fruit which is naturally sweet. If I tried to keep up with the FDA’s labeling practices with regards to sugar, my eyes would cross after day one. 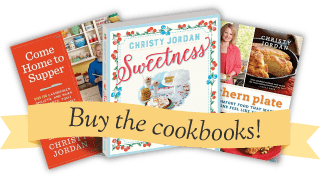 Be sure you check at the end of this post for a listing of other recipes on Southern Plate for those of us watching our sugar. There are several! You’ll need: Graham Crackers, whipped topping, milk,and a large box of instant pudding mix. Scary that I have all name brand here, isn’t it? I’m kind of spooked by it myself. Lets get to making goodies! 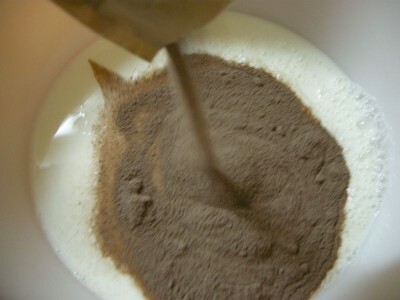 Add your pudding mix to the milk, using the amounts called for on the package. Mix that up for about two minutes, until well blended. 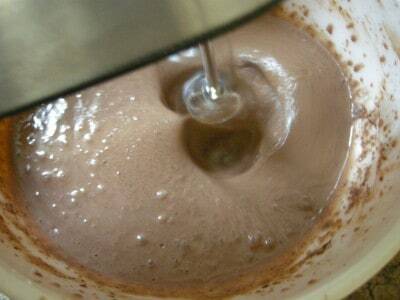 When your pudding is all mixed up, add whipped topping and mix again until well blended. There we go, all whipped up! 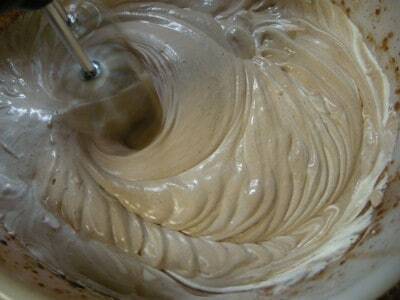 This will be smooth and creamy, the perfect “faux ice cream” for our grahamwiches! This really is delicious and I hope you try it. Make them with your kids or grandkids or save ’em all for yourself, whatever cranks yer tractor. I’ve been known to make these and keep them all to myself for a least a month before letting other folks know they exist. 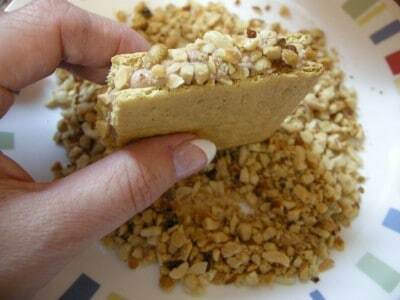 Break graham crackers in half and place on a plate to get ready to make these. This is just the amount I started out with, I ended up using about double this. Put a dollop of cream on half of a cracker. 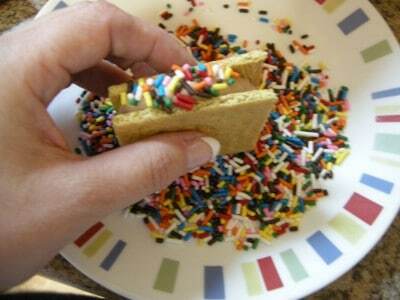 For the kids, I pour out some sprinkles on a plate and just gently press each side into them. I love the crushed nuts on them for me. You get the whole salty, chocolaty, sweet thing goin’ on! Plain is also delicious though! You can smooth the sides with a butter knife or the back of a spoon if you like. 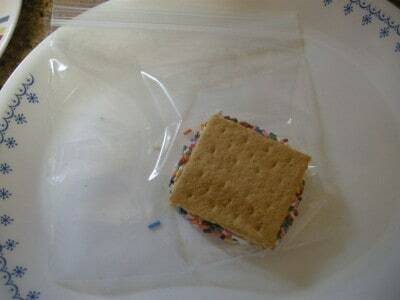 I put each one in a cheap little sandwich baggie and then place all of the baggies in the freezer until we need them. They will be frozen in an hour or so. This is important to know because Katy kept coming to “check”on them. With sugar free pudding, sugar free whipped topping, and naturally low in sugar Graham crackers, these are Grahamwiches for everyone! Prepare pudding with milk, according to package directions. 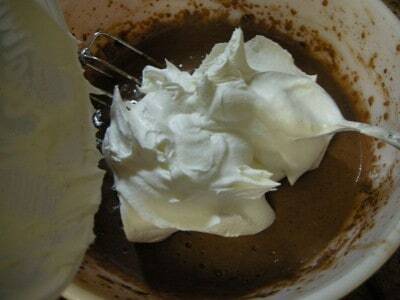 Whip in whipped topping and blend until smooth. 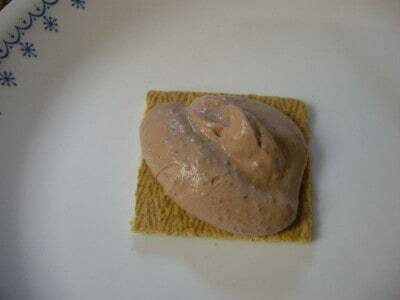 Place a large dollop on a graham cracker and top with another. Dip each side into sprinkles or nuts if desired. Place in individual zipper seal sandwich bags and freeze until firm. ~Southern Plate Reader Lynn from GA. Fill me up! Click here to leave your quote and make my day! Brady and his traditional Birthday Biscuit! Every person in my family gets a biscuit with a candle for breakfast, then phone calls pour in of folks singing to them! CONGRATULATIONS TO LESLEY IN ALABAMA FOR WINNING! Southern Plate Celebrates 1 Year With A Block Party! Wooo, am I really first? 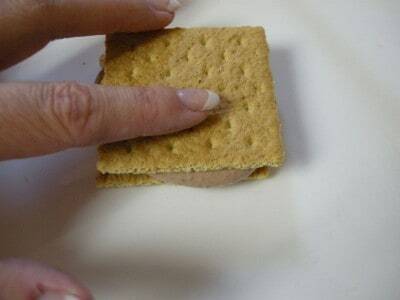 We have a ton of graham crackers left over from s’mores so this recipe looks like it will be great! “By the time he is twenty, I feel confident I’ll know what I’m doing.” Sorry to inform you but my daughter is 21 and I still have not reached this stage. It’s all wonderful though and I would never ever trade motherhood for anything. Plus Happy Birthday Brady!!!!!!!!! ok, i’m leaving work early just to go home and make these!! (kidding) they sound delicious and i’m hungry now! You and your sister are blessed to have a wonderful mom and cook! Christy, they grow up too fast. I remember when my youngest was in diapers. Now, she’s a teenager and knows everything. You will look forward to all of the eye rolling and sighing………but, I would not trade it for anything in the whole world. Right now the crockpot is cooking your steak tip recipe…YUM !!! Looking forward to more delicious Southern recipes. These sound yummy and so easy to make! I’ll have to make them with my daughter Caroline. Speaking of Hamilton Beach, they make great products. I just bought a nice ice cream maker with the bowl that goes in the freezer for 2o bucks at Wal-Mart. It made some delicious 4th of July ice cream 🙂 Mmmmmmm, mmmmmm. Happy Birthday Brady! Can I just say you made me cry! I get teary anyime I think about how fleeting my time with my baby is (she’s 3!). Gosh, what will I do when I’m not “mommy, that piece of furniture that brings me stuff and wipes my hiney”? AWWWW!!! Love the idea…this is a great thing to whip up at the beach next week! Like the recipe and love the mixer. I could so use that. I have been through at least 3 hand mixers in my 15 years of marriage. I tend to have the same problem with blenders too. I think I’ve gone through at least 4 of those. Think I will try these with the cheesecake flavor pudding…YUM. What a great idea, Teri. I’m headed to the kitchen to try this right now. Cheesecake is second only to chocolate around here. Happy birthday to Brady. Thanks for posting… these look great. I am excited to try these! What a yummy and easy treat! Thank you for sharing all of your recipes…this looks like a good one! This recipe will be a great one to have on hand for all members of the family–young and old! My husband is a type 2 diabetic and his birthday is Thursday…woohoo-he is getting these!! Happy bday to Brady too!!! I am sure my husband sends his thanks in advance! Happy Birthday Mr. Brady. We have a Brady (also known as Lil Bit) in our home too and he is such a delight. Brady’s are special little boys. Hope your birthday is the best ever. And the Grahamwiches?? I am so making these when I get home from work today. While my Li Bit is still too little to eat them I’m for certain Lil Man will eat enough for both of them. I know what you mean..time does fly by quickly, it makes me very sad. My oldest turned 13 last month! First of all, Happy Birthday, Brady. Ah, to be 10 again–enjoy your special day. This recipe ‘beefs-up’ the one I’ve used in the past. I never thought to try mixing the pudding with my Cool Whip. In the past, I’ve made this sandwiches by spreading Cool Whip between the graham crackers or between chocolate rice cakes. I can hardly wait to try it with the puddin’. I think I’ll stopy right now and go make some. They should be ready to eat by lunch time. Thanks for another wonderful receipe. I received my cookbook and can’t wait to get going on some of those wonderful recipes, too! I used to make these with my mom, but have not made any in awhile, but never thought about putting in pudding mix. I just used the cool whip and the chocolate graham crackers (do they still make those). 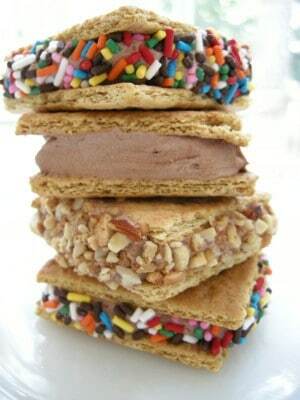 I love ice cream sandwiches, but my mom hated for me to eat so many of them because of the calories. So the graham cracker and cool whip sandwiches were the thing to hit the spot. I think that I will have to make up a batch this week. I’ve looked all over for chocolate graham crackers and finally found a few on a grocery store about 30 miles away. I don’t know what was wrong with me, tho – I only bought one box!!! I love them with the Cool Whip between and then frozen. However, I’ve been breaking them up and using the Cool Whip as a dip!!! YUMMY!!!! And since I am a type 2 diabetic, I can eat these as long as I don’t go overboard with it – It’s SOOOO great to have something delicious that’s also healthy!! Christy – I am going to try your recipe, too cuz that looks pretty delicious and harmless for me. Thanks so much!! And Brady – HAPPY BIRTHDAY!!!!! I’ve never heard of a birthday biscuit before but it sure looks good!!! Oh – and I sure do like that mixer!!! I’ve never seen that one – and if you should pick me, I’d be in heaven using it!!! Motherhood is that wonderful job that by the time they grow up and leave we think we might have figured it all out. I think that is why people say they should have had grandkids first. First children are so special because they really are our testers. And though we love all our children with all our hearts, there is always a special place for the first one. Happy Birthday, Brady. And congrats Mom! I love this idea for the Grahamwiches. I’ll have to make some this week for the kids! I think I’ll try them with the chocolate graham crackers and maybe a different flavored pudding – banana, oooh, or maybe caramel?!? Yummy! 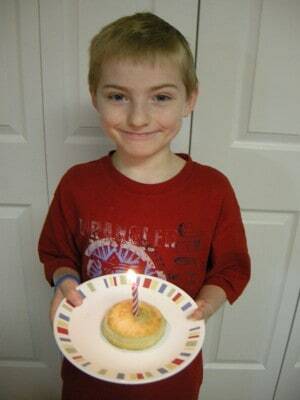 Happy 10th Birthday Brady! You are so lucky to have the mommy that you do! I hope you realize that and cherish her forever!! Love the mixer!! I have been telling myself I was going to get a new one but I haven’t yet. I will be patient and wait until Friday. 🙂 Either way I will be buying this handy dandy mixer! Thanks for the review. Looking foward to making this recipie!! HAPPY BIRTHDAY BRADY! We BOTH got to celebrate birthdays over these last few days! My little guy saw these grahamwiches and wants to know when I’m going to make them, Christy! Hope you had a fabulous 4th (I did… it was my birthday! )and enjoy your day with your handsome young man! Happy belated birthday Kay. It was my son’s 36th birthday. When he was little he touht all th epicnics, parades , and fireworks were for his birthday! Actually he may still think soas he is not lacking in self confidence. Best wishes. These look delish! I have a 7 year-old son who also eats everything in sight so I’m sure these will be a winner! Speaking of winners, I’d love to have this mixer! Thanks for all the yummy recipes, my family loves them. These look so simple! I love those “simple” recipes! I hate cooking when recipes call for items that I’ve never even heard of. The Grahamwiches look awesome. I can’t wait to get home from work to make them with my boys … they will love helping me and love eating them even more. I am like you, I love Hamilton Beach products and have not seen this mixer, but would love to have one. I usually burn up at least one if not two during the year with my baking and candy making. I love the idea of a breakfast biscuit … I may have to have adopt this or a version for the three men in my life 🙂 I love making birthday and holidays special … Happy Birthday Brady! Christy, enjoy the moments, they fly by way to fast. Love you and your site! Today is my daughter’s 11th birthday!!! We really must have some sort of parallel life! What a great summertime activity to do with the kids!! Can’t wait to try it :-). Please enter me into the giveaway – I would LOVE to have a mixer like that! Have a great day Brady!! Happy Birthday Brady. Ten is a very special birthday as you are one decade old. This day was also my grandma’s birthday and if she was alive she would be in somewhere around 120 years old but not forgotten as grandmas are always special people in our lives. 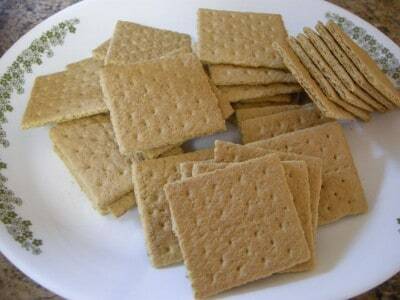 As far as the broken graham crackers-my theory is that you can eat them and they are calorie free as the calories have leaked out the broken edges. This also applies to broken cookies and the messy piece of pie. I would love to win the mixer as both my sisters have the big fancy Kitchen Aid stand mixers and I am soooooo jealous. I have a $5.99 Sunbeam with crooked beaters. I think it came from a thrift shop.